Customer traffic is up, which points to higher profits ahead for this retailer. What: Athletic clothing specialist lululemon athletica's (NASDAQ:LULU) stock spiked 14% higher in June, according to data provided by S&P Global Market Intelligence. The rally has helped produce a 40% jump in shares so far this year, compared to a 3% gain for the broader market. So what: June's bounce was powered by encouraging news on the retailer's latest operating trends. The company revealed on June 8 that comparable-store sales rose by a healthy 6% in Q1. Sure, that marked a slowdown from the prior quarter's double-digit bounce, but it was enough to keep Lululemon growing in an industry that's seeing falling customer traffic. Gap's (NYSE:GPS) first-quarter comps, for example, were down 5%. Better sales growth translated into solid profitability for Lululemon. Gross profit margin declined only slightly, dipping to 48% of sales from 49% a year ago. Gap, along with many other clothing retailers, didn't perform as well; its gross margin dove to 35% of sales from 38%. Now what: Lululemon CEO Laurent Potdevin and his executive team hope to reach a $4 billion annual sales pace by 2020, or double last year's result. To achieve that aggressive goal, they'll need to innovate new and improved products across the men's and women's apparel categories. Lululemon also expects to boost its store presence at a pace of 12% per year in the key U.S. market while building out internationally. Finally, direct e-commerce sales should contribute an increasingly large portion of revenue. Executives can't control industrywide pressures that might get in the way of these plans. 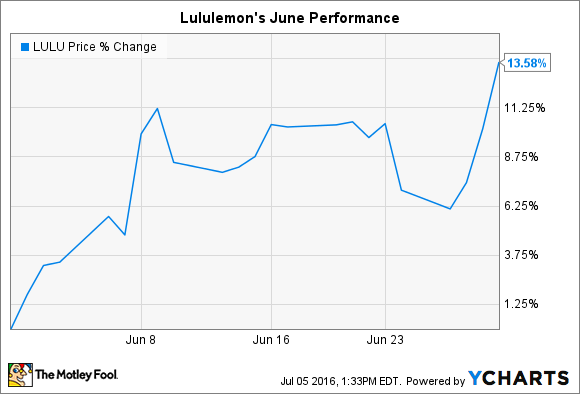 The stock has room to keep rising, though, if Lululemon can continue stealing market share. Assuming the recent positive customer traffic trends hold up, then investors should see this retailer soon post improving profitability for the first time in years. That spells faster earnings growth ahead, which understandably has Wall Street turning more optimistic about the stock.